I have never had really thick hair, but after having my third child, my hair experiences major thinning. I do not have bald spots, but my hair is thin and lifeless. 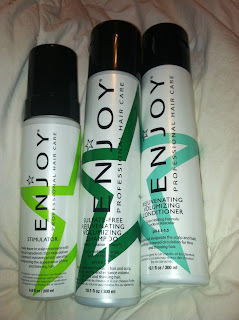 I was happy to receive and review Enjoy hair products, and I think that you will love them as well. I have been using the Enjoy Sulfate-free Volumizing Shampoo and Conditioner for about a month, and my hair really appears to be thicker and fuller. I wash and condition my hair every other day. The shampoo and conditioner have almost a minty smell which is so soothing after a stressful morning! Very refreshing and calming! The product I enjoy the most if the Stimulator. The Stimulator is almost like a hair mousse, and it makes a noticeable difference in my hair when I use it in the morning. It makes my hair look much more youthful and it gives it much more body, which also makes it look thicker. Want to win your OWN Enjoy haircare products? Enter Below! With all the girls in this family...this would be a great prize!! I would love to try the stimulator. I like the Sulfate-Free Rejuvenating Volumizing Shampoo. I would like to try the ENJOY Styling Gel. I like the Sulfate-Free Luxury Shampoo. Sulfate free shampoo and leave in conditioner were my recommended products so I would love to try those. I'd like to try one of the flat irons! I love using pro naturals argan oil shampoo and conditioner, they're also sulfate free. They make my hair look gorgeous! I think I would like the VOLUMIZING MOUSSE, since I use mousse daily. I like the sulfate free shampoo. I like the Straightener the most! I would also enjoy the Sulfate-Free Luxury Shampoo. I like the Shine Spray! I like the Sulfate-Free Shampoo. Would love to try it. I would love to try the Compact Flat Iron from Enjoy Hair Care! I like the Volumizing Day Shampoo. 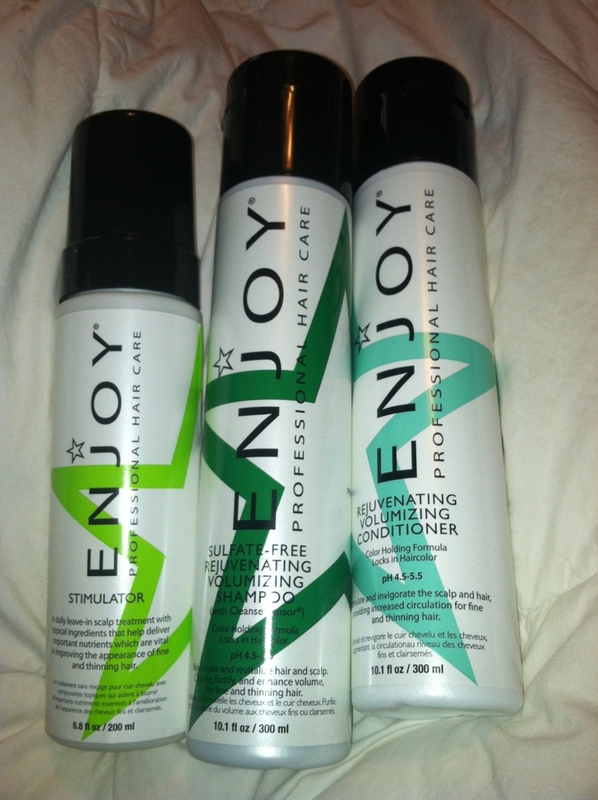 I love the Enjoy hairspray. It is great for my short hairstyle.